The centre-half role in football has undergone many changes. From an attacking role in the 1920s, the centre-half was pulled back to the heart of defence. In the 1960s, the 'libero' was born or 'sweeper centre-half' as it was called by the British. Then, in the 1980s, the centre-half became known as a central defender with a role that qualifies him as a rearguard man and an advancing midfielder, depending on the circumstances. One of the best Maltese central defenders of the modern era was undoubtedly Silvio Vella. 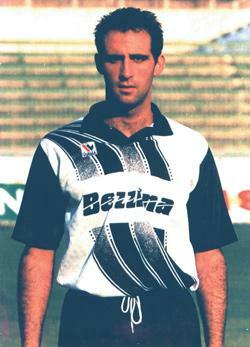 He played for Rabat Ajax, Hibernians and the national team. Vella was born in Toronto, Canada, on February 8, 1967. Fortunately for our game, his family returned to Malta in 1970. Canada's loss proved to be Malta's gain because he was to develop into one of the best Maltese footballers of his time. A product of Rabat , Vella made his debut in senior football as a substitute against Birkirkara on September 8, 1985. He played his first full match a fortnight later against Hibernians, helping the Magpies to a 2-0 victory. In those days Rabat were at the outset of the best era in their history. It was not easy for a fledgling youngster to command a place in the first team. Vella's defensive abilities in midfield, however, soon earned him a permanent place in the side. With Rabat, Vella won a league title, the FA Trophy, Super Cup and Euro Cup. Three years after making his bow in senior football he was selected to form part of the national squad. He made his debut for the country in the away match against Israel on October 18, 1988, in Tel Aviv. Vella went on to represent Malta in 90 international matches. A strange fact, however, about Vella's international career is that he was never picked to play for the country's junior sides. In 1993-94, Vella became the second Rabat player, after Carmel Busuttil (1985-86), to claim the coveted Footballer of the Year. That season his performances for team were of the highest quality, despite Rabat suffering relegation. Therefore, he became the first and so far only player to win the award in a season when his club lost its status in the top flight. The next season Rabat had to accept the stark reality that they could no longer afford to keep their star players. Reigning champions Hibernians were interested and at the start of season 1994-95, Vella joined the Paola club first on loan and later on a permanent basis. During his first season with Hibs, Vella won another championship and a Super Cup medal. It was the start of a long and successful association with Hibs that was crowned with an FA Trophy medal in 1998 and another league title in 2001-02. At the end of 2001-02, Vella announced that he was quitting the game. Although the committee knew that Vella had been mulling over retirement, the news came as a shock for everyone connected with Hibs. Having no ready replacement for him, they tried to change his mind but Vella only agreed to extend his services up to the end of the Champions Cup matches. It was, in the circumstances, a very wise decision. Wednesday, July 24, 2002 was the biggest night in the history of Hibernians FC. Playing against Irish champions Shelbourne, the Maltese team registered their first away victory in a European competition to win a place in the next round of the competition. In the second round, Hibs were drawn against Boavista. They lost 0-4 to the Portuguese champions but Hibs did the country proud in the return match at Ta' Qali. Trailing by three goals to one at the end of the first half, the Maltese champions looked to be on their way to another heavy defeat but in a glorious comeback, Hibs managed to turn a 3-1 defeat into a 3-3 draw. This memorable performance by the Paolites was a fitting farewell for skipper Vella who played his last game before retiring from active football.